From the beginning of time, to our day and eons beyond, there have been many stories intertwining like the symbol of infinity. Origins of both life and humanity, as well as the universe itself are the dynamic fodder of the DINOSAUR WEB COMIC GRAPHIC NOVEL ANTHOLOGY! Some stories and/or elements in them are pure Sci Fi Fantasy, others, are wonderful Science Fact. Ferocious dinosaurs and hybrids, creatures, time travel, beautiful adventurers, robots, galaxies...Come explore!!! 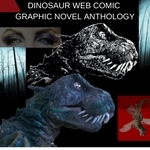 DINOSAUR WEB COMIC GRAPHIC NOVEL ANTHOLOGY...I MAKE REALISTIC POSABLE DINOSAURS AND CREATURES!